Take part in the Recipes for Life food bloggers challenge and you could see your dish featured in a new charity cookbook! We’re already into month three of the Recipes for Life challenge and I’m rather excited about the three ingredients we’ve been set for April by the SWALLOW cookery club. They are: pork, sweetcorn and tomatoes. Like last month, they might not at first appear the most obvious of culinary combinations. But give it a few moments’ thought and I’d be surprised if a whole host of tasty meal ideas don’t start whirring around your brain! The rules of the challenge are the same as before; simply come up with a wholesome, delicious and easy-to-cook recipe featuring this month’s three key ingredients, and which members of the cookery club at SWALLOW can cook themselves. Through its Fit for Life programme, SWALLOW runs cookery courses for adults with learning disabilities, giving them the skills and confidence to prepare simple, inexpensive and nutritious meals. They are looking for new recipes to cook on the course, and ultimately to include in their new cookbook. 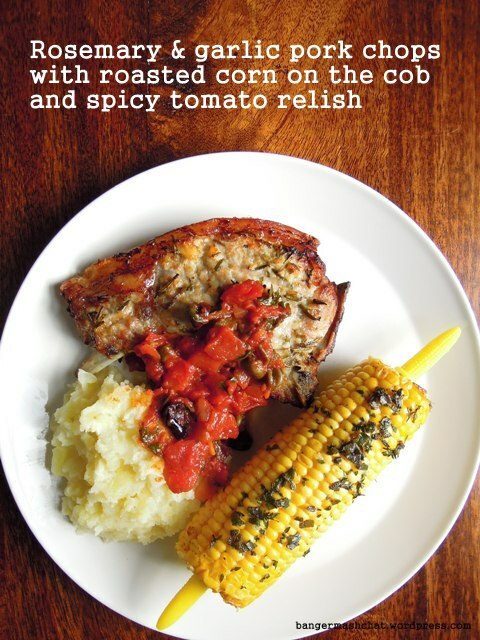 So what meal could you rustle up with pork, sweetcorn and tomatoes? You can use any pork-based product you fancy – a whole joint or chops, bacon or ham, sausages or mince. The sweetcorn can be fresh, on the cob, tinned or frozen. And the tomatoes can again be fresh, tinned or perhaps sun-dried – you might even get away with a puree or passata. So you see, it’s really a rather versatile shopping list this month. Display the Recipes for Life badge (shown above and below) on your recipe post, and link back to this challenge post. You may enter as many recipe links as you like, so long as they are based on the three main ingredients selected for this month and accompanied only by basic store cupboard items. Send your recipe URL to me at vanesther-at-reescommunications-dot-co-dot-uk, including your own email address and the title of your recipe or post. The closing date this month is Tuesday 23 April 2013. If you tweet your post, please mention #RecipesforLife, @BangerMashChat and @SWALLOWcharity in your tweet and we will retweet everyone we see. A selection of recipes entered each month will be featured in the SWALLOW cookbook to be published later this year, helping the charity to raise much needed funds for its ongoing work. Buy your pork chops from the butcher and ask for them to be cut nice and thick – they stay much more moist and succulent that way. I like to roast my corn on the cobs in the oven in a little butter with whatever herbs I have available; the end result is so much sweeter and tastier than if you simply boil them. The spicy tomato relish includes some optional extras such as olives and capers but don’t worry if you don’t have these or you don’t like them – the relish tastes just as good without. And some simple mashed potato on the side is perfect for soaking up all those delicious buttery, meaty juices. Start by preparing the marinade for the pork. 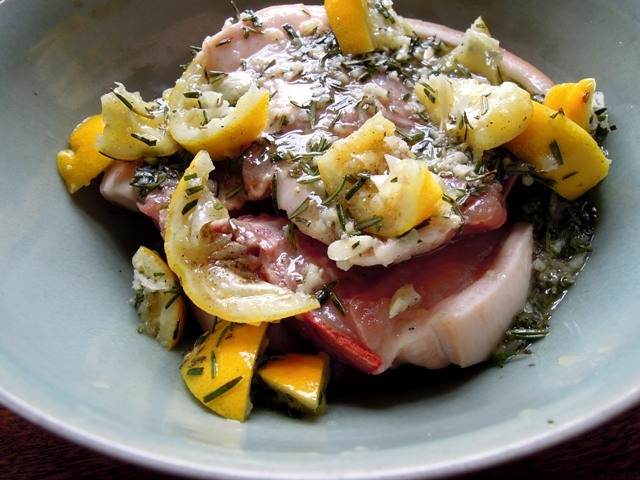 Place the pork chops in a large dish. Pull the rosemary leaves off the woody stems, roughly chop and give them a good pounding with a pestle and mortar. Put the rosemary in a bowl with the crushed garlic and olive oil. Chop the lemon in half and squeeze the juice into the bowl. 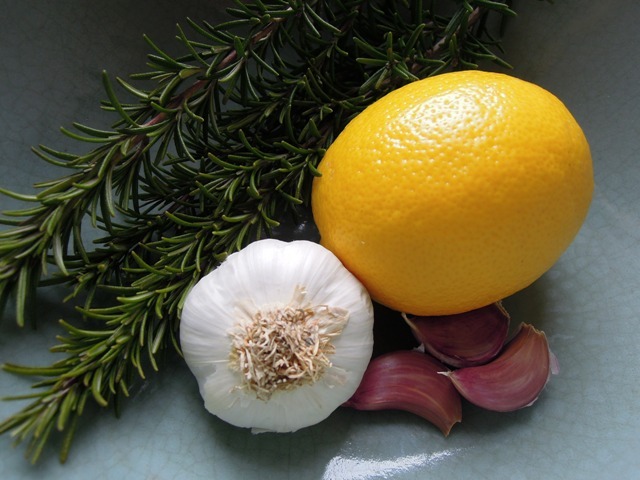 Chop up the lemon skin, give it a good bash with the pestle and mortar and add to the bowl with a little salt and pepper. Mix it all together before pouring onto the meat. Get your hands in and rub the marinade all over the chops so they are well smothered. Cover and leave for a couple of hours. Prepare the corn on the cob by firstly placing them on large sheets of foil. Generously smear each cob with butter, season and sprinkle over your chosen herbs. Wrap the corns in the foil, leaving a little room for the steam. When the pork is marinated, place on a wire rack over a roasting tray and bake in the oven for 20 to 25 minutes, depending on how big your chops are. Turn halfway through the cooking time. The chops are cooked when there is no sign of pink inside and are nicely browned on the outside. Roast the corn in the oven at the same time, placing them directly on the oven shelf. They should take around 20 minutes. 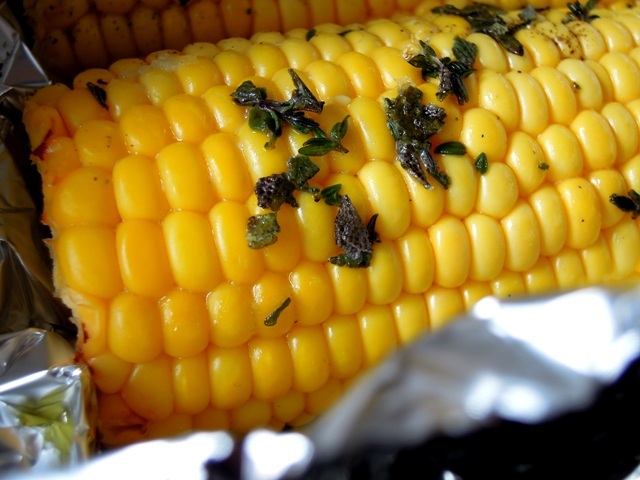 Test the corn with a sharp knife and remove from the oven when they are just tender. Leave wrapped in foil until you’re ready to serve. While the chops and corn are cooking, make the tomato relish. Heat the oil in a frying pan and gently soften the onion until it is golden. Add the paprika and cook for a minute or two before stirring in the chopped tomatoes, vinegar, sugar, salt and pepper. If you are using, also add in the capers and olives. Cook gently for 10 to 15 minutes until the relish has thickened. Mix in the coriander right at the end. 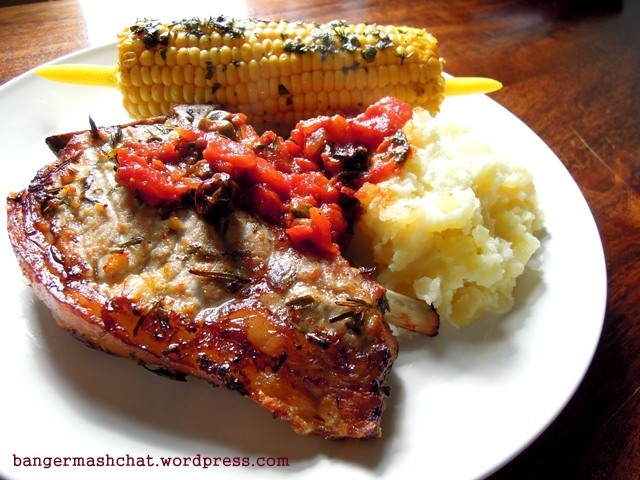 Keep the relish warm until the pork chops and corn are ready and serve on warmed plates, ideally with some mashed potato on the side. That’s what I call proper family grub – it’s definitely finger licking good! Hmm not sure I can rustle a cake up out of these ingredients! Now how exactly are we to beat your tasty wee dinner here? The marinated chops look fabulous, sweetcorn roasted in the oven sublime and you’ve even topped it off with a cheekily zingy relish! Hmmm I’ve got a lot of thinking to do. Just remember the pork can be pretty much anything from salami or sausage to a whole shoulder joint – I bet you can come up with something! If I was to come up with something using veggie sausages that could be substituted with the pork version, would that be OK to enter? Would love to join in, but pork is not a good ingredient for a family of vegetarians! That would be absolutely fine and I think it would work really well to show how easy it is to adapt dishes to create vegetarian versions. If you submitted it early enough I might have time to cook it too so I could show the meat version when I do the round-up?